Provincial police are searching for three inmates who escaped from a Quebec City detention centre using a helicopter. Provincial police are searching for three inmates with previous ties to the Hells Angels who escaped from a Quebec City detention centre using a helicopter. 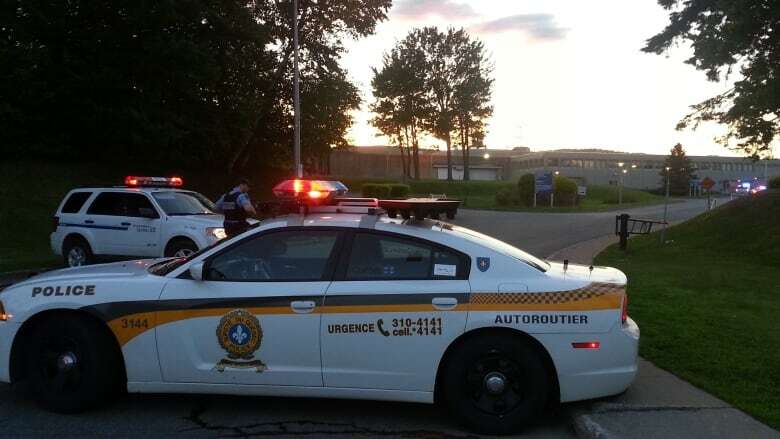 A Sûreté du Québec spokesperson confirmed to CBC News that the prison break occurred at 7:45 p.m. ET from Orsainville Detention Centre and the inmates fled westbound in a green helicopter. "We are talking closely with the detention centre to figure out exactly how the escape transpired,” said Ann Mathieu. "The priority number one is to find the helicopter." Police are now searching for Yves Denis, 35, Denis Lefebvre, 53, and 49-year-old Serge Pomerleau. In 2010, Lefebvre was arrested by provincial police after a drug operation bust known as Project Crayfish that led to dozens of arrests. He was reported to have had ties to the Hells Angels. During the bust police seized multiple weapons, 41 vehicles, a plane, a helicopter and $905,000, CBC Radio-Canada reported. The three who escaped were being held at the detention centre waiting to stand trial, but it was not immediately clear what charges they were facing. Police are warning anyone who sees the men not approach them and to call police immediately. Last year, there was a daring escape at St-Jerome prison in Quebec involving a helicopter where a pilot was forced at gunpoint to pluck two inmates from the facility on a Sunday afternoon. The two escapees and the two suspects who hijacked the chopper were caught by police within a few hours of the escape.